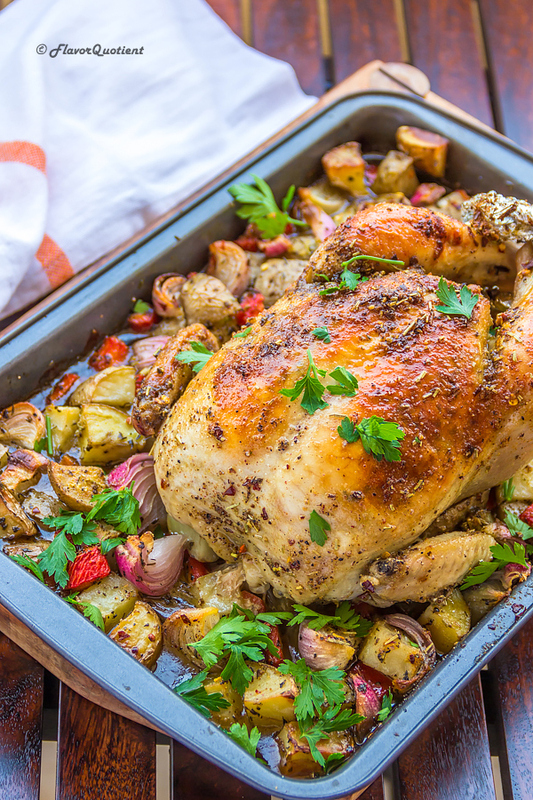 The holiday season won’t be fully satisfying unless you have the best ever roast chicken at your dinner table; so here is the guaranteed fail-proof whole roast chicken recipe to jazz up your holiday meals! The year is coming to an end and with holiday season in full swing, you have to gear up your recipe repertoire with holiday special recipes. So here I bring my most-wanted whole roast chicken recipe with a step by step video to make your family dinner more special! 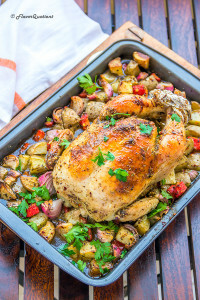 If you even have a slightest doubt about flawlessly roasting a chicken at home, then don’t think twice now; you have come to the right place and you will never have to worry again for the most perfectly roasted juicy and moist whole roast chicken. 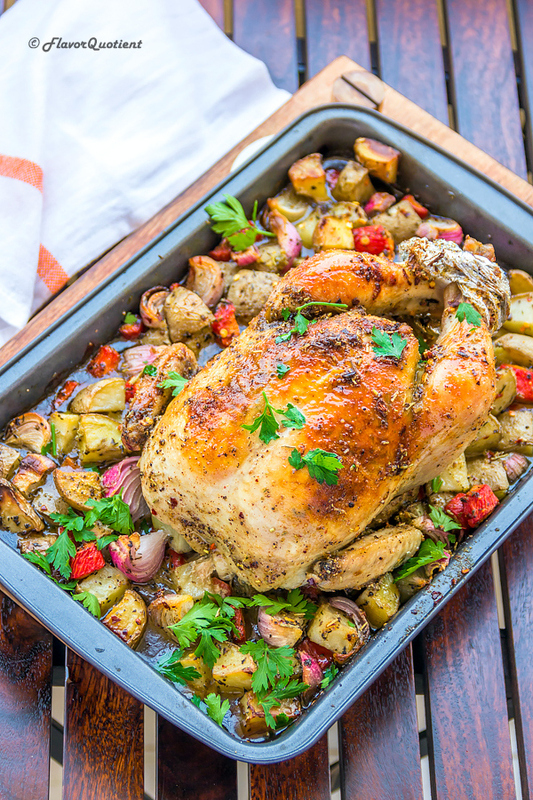 I am so happy and confident with this recipe of whole roast chicken because after many tests and trails, I could finally arrive at THE recipe which gives me a super-juicy, perfectly cooked roast chicken every time! This is the kind of recipe which you enjoy most with family and friends. With such good food you create more and more good memories to cherish for years to come. This is what I like about festivals; only during such times we are allowed to cheat our daily schedules and be a little wild. It is time like this that we relive our childhood for however brief period it may be. Spending time with family brings inner joy and happiness on its own and having a great meal with them is just the cherry on top of the icing! Don’t you think so? 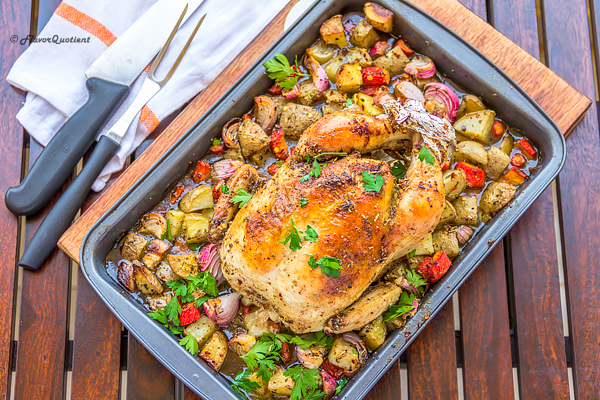 If you were planning to make a whole roast chicken this holiday season but still unsure about the recipe, then it is right here before you along with some tips and tricks to churn out the best ever roast chicken at your dinner table; this time, every time. Tip 1: Use a fresh chicken for roasting; try to get the freshest chicken possible and don’t go for the one which is sitting in your freezer for couple of days. Tip 2: Use skin-on chicken. Skin helps to keep the moisture locked inside the chicken so that it does not dry out during roasting. Tip 3: Preheat your oven appropriately, preferably using an oven thermometer. Every oven is different and takes different time to heat up and we don’t calibrate the built-in thermometer often. So, it’s best to leave the guess-work out and use an oven thermometer to reach the right temperature for roasting. 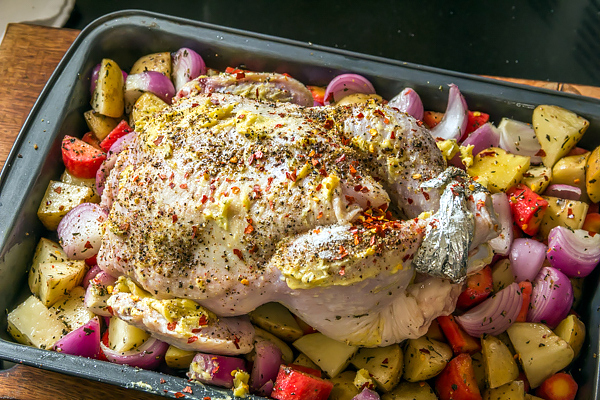 Tip 4: While roasting the chicken, it is recommended to place the chicken on top of a bed of veggies or on a roasting rack. This gives the chicken a lift ensuring the chicken does not get poached in its own juice and heat could circulate all around. Tip 5: Brush the chicken once with olive oil during the roasting. This is called basting and helps keeping the bird moist and juicy. Tip 6: If you feel that your chicken is turning too brown, cover it with aluminum foil during the last 15 minutes of the cooking. Tip 7: Do not open the oven frequently while roasting, this will bring the oven temperature down resulting in uneven roasting. Tip 8: It is recommended to check the doneness of the chicken using a meat thermometer and the internal temperature of thickest part of the chicken i.e. the drumstick should reach at least 165 F. If you do not have a thermometer, cut the chicken using the edge of a knife and if the juices are running clear with no traces of pink, the chicken is perfectly cooked. Tip 9: Do not cut the chicken immediately after taking it out from the oven. Let it sit for 10-15 minutes and then carve it out. Tip 10: This is my favorite tip and my mandate while doing a roast chicken! Never ever do a roast chicken without potatoes! Skin-on roasted potatoes are so crazily crispy and flavorful after bathing in all chicken juices that you will get addicted to it! With all those tips, I am sure you are now all geared up to rock that roast chicken this holiday season! Do tag us @flavorquotient in all your creations and we will love it! Happy holidays! Wash the potatoes thoroughly but do not peel them. Skin-on roasted potatoes turn out more crunchy. Cut the wash potatoes into large chunks. Wash and peel the carrots. Then cut them into large chunks. Peel onion and cut them into large chunks too. Add all the cut veggies into a baking dish. Season them with salt and drizzle about 3 tablespoons of olive oil. Then add the Italian seasoning. Mix the veggies using a spatula thoroughly making sure all veg chunks are seasoned and coated with oil. Set it aside. Take the softened butter in a bowl. The butter should be semi-soft; if it is too soft, it will start melting while smearing it on the chicken. Add dried rosemary, garlic powder and garlic salt to it. Using a fork, break the butter and mix it evenly with all the seasonings. Now it’s time to prepare the chicken; but before that preheat your oven to 220 C / 450 F and place the wire rack at lowest level. Wash and pat dry the chicken. Season the cavity of the chicken thoroughly with salt and pepper. Now season both sides of the chicken with salt and pepper. Then smear the chicken all over with seasoned butter – insert the butter inside the skin on top of the chicken breast; this will ensure a super-moist and tender chicken breast after roasting. This is a messy process but there is no two ways about it. Place the chicken on top of the prepared vegetables keeping the breast side up. Insert 1 head of garlic inside the cavity of the chicken. Tie the legs with some rolled in aluminum foil. Then drizzle the remaining olive oil on top of the chicken. Sprinkle some more black pepper and hot red pepper flakes for some spicy kick. Roast the chicken and veggies in the preheated oven for 10 minutes at 220 C / 450 F. Then take it out and brush chicken with olive oil all over. Reduce the oven temperature to 180 C / 375 F and roast the chicken for 1 hour and 20 minutes or until the internal temperature of thickest part (e.g. thighs) reaches to 165 F.
Take the chicken out and let it rest for 15 minutes before carving. After 15 minutes carve the chicken and serve with the warm roasted veggies and my delicious balsamic glazed roasted brussels sprouts. Enjoy!